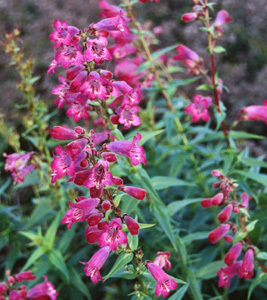 Joy Creek Photo Archive (c) all rights reserved Penstemon 'Sour Grapes' has large violet-red flowers that have a blue-gray cast. Mid-width rich green foliage. Summer to first frost. 2.5 ft. x 2 ft.
All of the garden hybrid Penstemons need full sun and well-drained soil. We mulch the crowns with 1/4-10 crushed gravel which discourages crown rot by letting water drain off the crown quickly. When planting Penstemons we fertilize them only lightly and then never again. Over fertilizing Penstemons promotes the development of lush soft growth which leads to excessive die back in the winter.